Key West Holiday Events: Lighted Boat Parade, New Year's Eve and more! 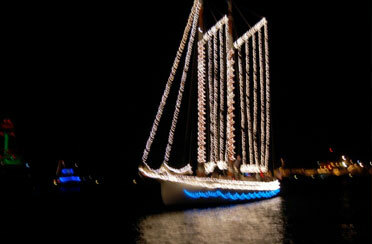 Key West Holiday Events: Lighted Boat Parade, New Year's Eve and more! We all know that Key West Holiday events are not only memorable, but a must do while in this destination. 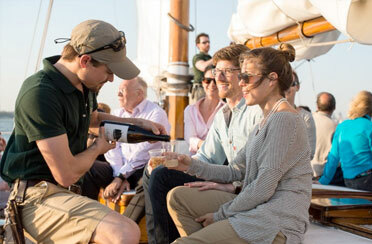 We want you to celebrate these holiday events with us aboard our schooner, with a glass of Champagne in hand. Enjoy the famous Key West Lighted Boat Parade and cruise with us through the Key West Bite. It certainly will be a unique experience to sit aboard the Schooner America 2.0 as it joins the parade! This yacht is decked out in holiday lights for a front row seat to this historic event. Looking to celebrate the New Year in Key West and view the “Lowering of the Pirate Wench”? Join us on the Schooner America 2.0 to be aboard the very yacht that lowers the Pirate Wench from its mast. This is by far the best seat in the house and crowd free for a VIP experience. Furthermore, we know that seeing palm trees decorated with tinsel, and boats decorated in Holiday lights is a memorable experience. 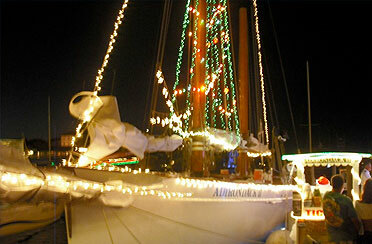 But to join us aboard the Schooner America 2.0 for one of the many Holiday events will make your stay epic. Are you just in town for the weekend? 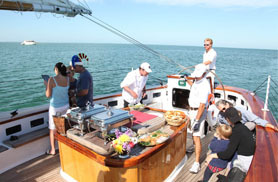 Then join us on a Key West day sail or the romantic Key West sunset sail to catch a glimpse of the “Green Flash”. Whichever you choose, you will be sure to have a good old Key West time!